I've had this Altenew Bold Alphabet die for a while and am always looking for ways to justify the cost. Even buying it for 20% off, it was still pricey. But I think it's a keeper. 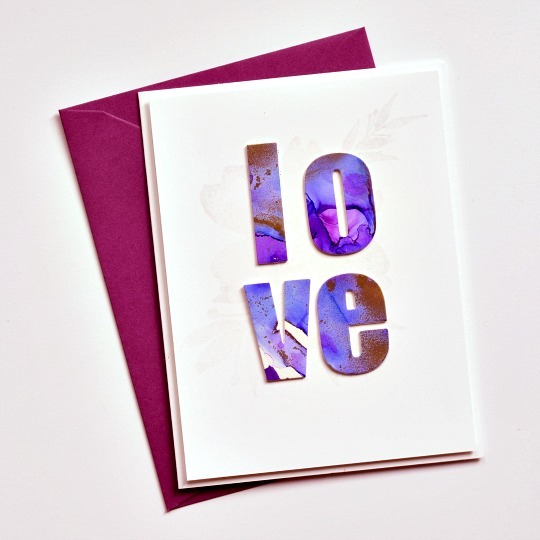 Colored Heavyweight Yupo paper with Jacquard Products Pinata Color Exciter pack (alcohol inks). The heavy Yupo paper is very different from the regular -- the regular is thin and "floppy." The heavy is quite stiff. I think it works well for die cuts. Used regular, dirt cheap, Rubbing Alcohol to move the ink around. Works like a charm. It also cleans up all my stamps. Love that stuff. Unfortunately, despite many takes, I was unable to take a photo that shows the light gray flower and leaves under the letters -- but it's there and looks great! In the light, the gold on the letters shines so brightly! MOOD WHEN DONE = I'm good. great way to use those letters (i have them too and must use them more) - love the colors you used and wouldn't have seen the flowers if you hadn't mentioned it. I noticed the flowers under the letters right away. Maybe they show up more in real, but I see a tantalizing hint of them. Very pretty! Look at you with the alcohol inks! Fantastic, gorgeous work with those! I know I need Yupo paper. It makes all the difference. If I ever get started with alcohol inks and like them, maybe I'll get the paper. Heavy, hmmm? I received some yupo paper for Christmas, not sure if it is thick or regular!! I am really excited to work with the alcohol inks on it! I did not notice the flowers at first, but I do love the letters! thanks for a beautiful reminder to use my Altenew dies! Love those colors!